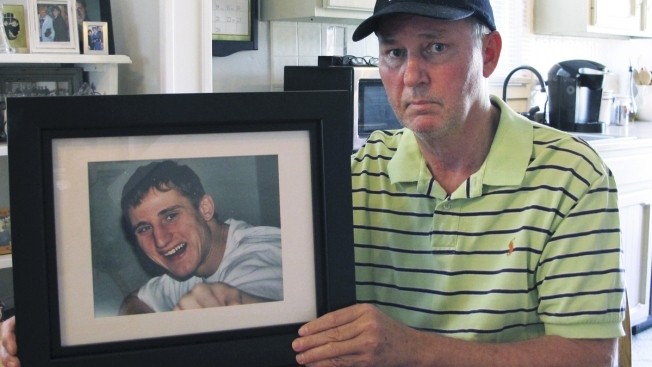 In this Feb. 14, 2019 photo, Dean Palozej poses with a photo of his son, Spencer, in Stafford, Conn. Spencer Palozej died of a fentanyl overdose in last year. His father supports a proposed state law that would create a new murder charge for people who supply drugs that cause fatal overdoses. The opioid crisis has spurred many state and federal officials to consider more serious charges for overdose deaths. A Connecticut state representative who heard the story felt the same way. With a piece of legislation introduced this year, he joined lawmakers around the country who have been pushing for murder or manslaughter charges in a get-tough campaign against people who supply drugs that cause fatal overdoses, in efforts to curb the opioid overdose crisis.